PENSACOLA, Fla.— The Center for Biological Diversity filed a petition today asking the U.S. Fish and Wildlife Service to give Endangered Species Act protection to the Gulf Coast solitary bee. 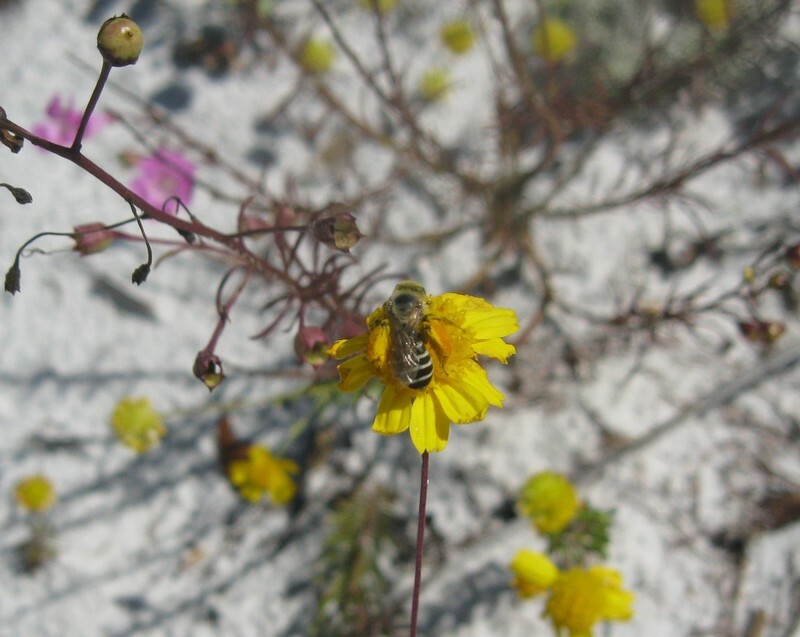 In the past decade, the increasingly rare native bee has been documented at only six locations along the coastal dunes and barrier islands of Florida’s northern Gulf Coast. This fuzzy, yellow-and-black-striped bee is a member of the oldest family of bees on Earth and the only known species of its subfamily in the eastern United States. It has been pushed to the brink of extinction by urbanization, pesticides and climate change-induced sea-level rise and storm surges. By the time the Gulf Coast solitary bee was discovered by scientists in 1993, it was found only in 15 locations from the coast of Mississippi to near Panama City, Fla. In 2012, when the last Florida-wide count was conducted, only 47 individuals were documented at six sites. Unlike the great majority of the nation’s more than 4,000 native bee species, the Gulf Coast solitary bee specializes in pollinating just one plant, the Coastal Plain honeycomb head, whose bright-yellow flowers are emblematic of the dune ecosystem. Female Gulf Coast solitary bees collect pollen from the plants to feed their young. They then deposit both the pollen balls and their eggs in burrows they dig in open areas of soft sand, which must remain undisturbed for the next generation to emerge. To survive, the Gulf Coast solitary bee needs areas with dense patches of the honeycomb head next to open areas of sand along the northern Gulf Coast. Unfortunately much of its habitat has been converted to housing and commercial development. In addition, the bee is only found within about 1,500 feet of the shore, making its habitat extremely vulnerable to rising sea levels and increases in storm surges caused by climate change. The combination of higher water levels next to human housing and extensive recreation has resulted in frequent spraying of bee-toxic pesticides to control mosquitoes and other biting insects. The decline of the Gulf Coast solitary bee is part of a troubling trend in many of the 4,000-plus species of native, wild, mostly solitary bees in the United States that are needed to pollinate the full spectrum of wild plants. Native bees provide more effective pollination of native plants than honeybees, which are not native to the United States. Wild pollinator declines across North America are due to habitat loss, agricultural intensification, pesticide use, invasive non-native species, and climate change. About 90 percent of wild plants and 75 percent of leading global food crops — including 35 percent of the global food supply — depend on animal pollinators for reproduction, and the great majority of that work is done by bees. Despite the growing evidence of the decline in bee populations, the rusty patched bumblebee is the only bee in the continental United States currently protected under the Endangered Species Act. Gulf Coast solitary bee photo courtesy Center for Biological Diversity. This image is available for media use.